RNA is extracted from cells,. | .and reverse transcription in the presence of a labeled nucleotide produces cDNA molecules with a fluorescence tag. 7'| A microarray can be constructed with thousands of different DNA probes. rescence, which can be detected by an automated scanner. An array containing tens of thousands of probes can be applied to a glass slide or silicon wafer just a few square centimeters in size. One type of DNA chip is illustrated in i Figure 19.19. For this chip, mRNA from experimental cells is converted into cDNA and labeled with red fluorescent nucleotides. Messen-gerRNA from control cells is converted into cDNA and labeled with green fluorescent nucleotides. The labeled cDNAs are mixed and hybridized to the DNA chip, which contains DNA probes from different genes. Hybridization of the red (experimental) and green (control) cDNAs is proportional to the relative amounts of mRNA in the samples. The fluorescence of each spot is assessed with microscopic scanning and appears as a single color. Red indicates the overexpression of a gene in the experimental cells relative to that in the control cells (more red-labeled cDNA hybridizes), whereas green indicates the underexpression of a gene in the experimental cells relative to that in the control cells (more green-labeled cDNA hybridizes). Yellow indicates equal expression in experimental and control cells (equal hybridization of red- and green-labeled cDNAs), and no color indicates no expression in either experimental or control cells. 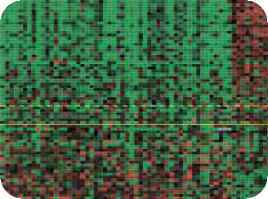 Microarrays that allow the detection of specific alleles, SNPs, and even particular proteins also have been created. Microarrays allow the expression of thousands of genes to be monitored simultaneously, enabling scientists to study which genes are active in particular tissues. They can also be used to investigate how gene expression changes in the course of biological processes such as development or disease progression. In one study, researchers examined gene expression to predict the long-term outcome for women who had undergone treatment for breast cancer. Breast cancer affects 1 of 10 women in the United States, and half of those with the disease die from it. Current treatment depends on a number of factors, including a woman's age, the size of the tumor, the characteristics of tumor cells, and whether the cancer has already spread to nearby lymph nodes. Many women whose cancer has not spread are treated by removal of the tumor and radiation therapy, yet the cancer later reappears in some of the women thus treated. These women might benefit from more-aggressive treatment when the cancer is first detected. ■Ml . :: ■ ■:■■• • ■. 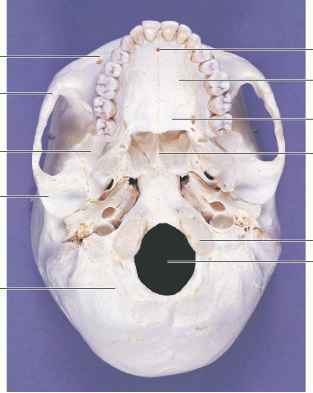 : Jlipl flU'jKmi.rni.iiVid » yrccn; iiidcdîd cvud ■ ■ .r: til !i Lfifie :! : -.i.ifc A ± U :.i. : ::.! A 19.19 Microarrays can be used to compare levels of gene expression in different types of cells. flU'jKmi.rni.iiVid » yrccn; iiidcdîd cvud ■ ■ .r: til !i Lfifie :! : -.i.ifc A ± U :.i. : ::.! 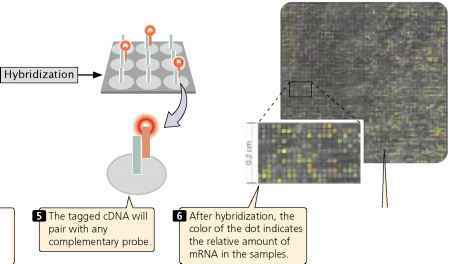 Microarrays, consisting of DNA probes attached to a solid support, can be used to determine which RNA and DNA sequences are present in a mixture of nucleic acids. They are capable of determining which RNA molecules are being synthesized and thus can be used to examine changes in gene expression. One of the best methods for determining the function of a gene is to examine the phenotypes of individual organisms that possess a mutation in the gene. Traditionally, genes encoding naturally occurring variations in a phenotype were mapped, the causative genes were isolated, and their products were studied. But this procedure was limited by the number of naturally occurring mutations and the difficulty of mapping genes with a limited number of chromosomal markers. The number of naturally occurring mutations can be increased by exposure to mutagenic agents, and the accuracy of mapping is increased dramatically by the availability of mapped molecular markers, such as RFLPs, microsatellites, STSs, ETSs, and SNPs. These two methods—random inducement of mutations on a genomewide basis and mapping with molecular markers—are coupled and automated in a mutagenesis screen. Mutagenesis screens can be used to search for specific genes encoding a particular function or trait. For example, mutagenesis screens of mice are being used to identify genes having roles in cardiovascular function. When genes that affect cardiovascular function are located in mice, homol-ogy searches are carried out to determine if similar genes exist in humans. These genes can then be studied to better understand cardiac disease in humans. To conduct a mutagenesis screen, random mutations are induced in a population of organisms, creating new phenotypes. The mutations are induced by exposing the organisms to radiation, a chemical mutagen (Chapter 17), or transposable elements (DNA sequences that insert randomly into the DNA; Chapter 20). The procedure for a typical mutagenesis screen is illustrated in I Figure 19.21. Here, male zebra fish are treated with ethylmethylsulfonate, or EMS, a chemical that induces mutations in their sperm. The treated males are mated with wild-type female fish. The offspring are heterozygous for mutations induced by EMS and are screened for any variant phenotypes that might be the product of dominant mutations expressed in these heterozygous fish. Recessive mutations will not be expressed in the progeny but can be revealed with further breeding. The F1 offspring are mated with wild-type fish, and the offspring from this cross are then backcrossed with their male parents, producing fish that are homozygous for recessive mutations. The offspring of the backcross are then screened for variant phenotypes. The fish with variant phenotypes undergo further breeding experiments to verify that their variant phenotype is, in fact, due to a single-gene mutation. After the genetic nature of an abnormal phenotype has been verified, the gene that causes the phenotype can be located by positional cloning. The first step in positional cloning is to demonstrate linkage between the trait and one or more already mapped genetic markers. The progeny of genetic crosses that include the mutant phenotype are examined for a large number of molecular markers that cover the entire genome. The cosegregation of markers and the mutant phenotype provides evidence of linkage, indicating that the marker and the gene encoding the mutant phenotype are physically linked on the same chromosome. Cosegregating markers provide information about the general chromosome region in which the gene is located. | Male zebrafish are treated with EMS to produce mutations in their sperm. | .and are then crossed with wild-type females.